First option is to program to the center of the tool. In this case all coordinates must be offset manually. This is usually done by a CAD/CAM system, since it is fairly easy for computer to offset the center of the tool. As you can see we had to manually add a 0.25" offset to al of our programmed points. This may look somewhat easy when doing a simple rectangle, but becomes hard and next to impossible when programming complex profiles. This is called "programming to the tool centre" This programming style is almost exclusive to CAM programs. is to program to the finished profile and tell the CNC machine to offset the toolpath by the radius of the cutter. In that case we have to first apply cutter compensation, and then simply key in our part coordinates to get the proper result - machine handles cutter radius compensation on its own. As you can see in the last example all we had to do is tell the machine to apply the cutter compensation. We used coordinates taken directly from our drawing. This is why this is called "programming to the part profile". Let me explain what exactly happens in the last example. g-code G41 tells the machine to apply the compensation to the left of out finished profile. G41 is most often associated with climb milling, so many CAM systems do not bother to inform you that it is left or right, they just specify "Climb milling". 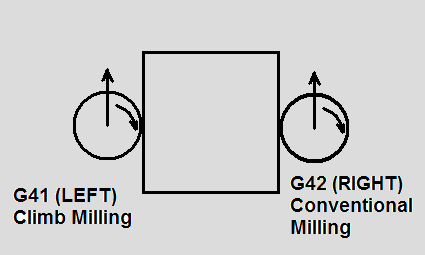 If we were to use Conventional milling, we would have to reverse the order of our toolpath, and program G42 code which enables cutter radius compensation RIGHT. Whenever we program G41 or G42 we need to also program a lead-in move to allow machine to apply the offset. Same goes to cancelling the offset with G40. Here is a picture showing the difference between LEFT and RIGHT cutter radius comp. Many machine controls have only one table for Length and Diameter offsets. So you may have to use different offset number than the one used for the tool number or tool length. Many controls do not allow G41,G42 or G40 move to be an arc. It almost always needs to be a straght X, Y or both move. Thank you for taking the time to make the tutorial. But one question. How how does using cutter compensation know we're using a 1/2" End Mill? How does it know to offset half the diameter of the cutter 1/4"? I see theÂ G1Â G41Â D55Â X0 Y0 F50.0Â move, but before this the X= -0.75 and Y= -0.75. So both X and Y are moving 0.75 in the positive direction. But 0.75 isn't half the diameter of the cutter. Any input on this? Thanks again! G41 D55 tells the machine to apply cutter radius compensation left and that it should take number from the offset table, record number 55. In that record we obviously should put 0.2500 , so that machine offsets by that much. Good eye! I forgot to mention it in the description. PS. We start so far away from the part, so that we don't plunge into our stock. Also machine needs a little room to apply the comp. Some machines can do it on a dime, so we can even start 0" away from the wall, others however need to actually move atleast the compensated amont for it to work. That makes perfect sense now. THANK YOU! !